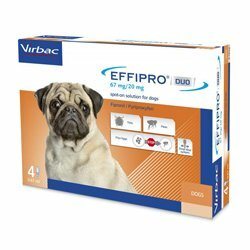 Effipro DUO for dogs is an effective spot-on for treating fleas and ticks. The topical solution treats flea infestation along with tick infestation. The integrated solution controls the multiplication of fleas by preventing flea eggs developing into adult fleas for 12 weeks after application. Effipro DUO provides the acaricidal efficacy for 2 weeks against Ixodes ricinus, and for 4 weeks against Dermacentor reticulatus and Rhipicephalus sanguineus. If ticks of some species (Dermacentor reticulatus, Rhipicephalus sanguineus) are present at the time of application, not all ticks may be killed within 48 hours. The regular treatment helps to control a recurring parasitic infestation. The spot-on is also recommended as a part of flea allergy dermatitis treatment. Effipro DUO spot on features the combination of two active ingredients – fipronil and pyriproxyfen. Fipronil is an adulticide and the other ingredient pyriproxyfen is an insect growth regulator. Fipronil kills the existing adult fleas and pyriproxyfen restricts the growth of different life stages of fleas. It helps prevent an increase of flea population and controls future flea and tick infestation. Effipro DUO is a monthly treatment, which is easy to apply with unique drop-lock system. 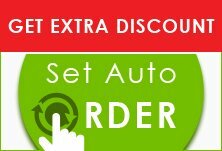 Yesterday, I got Effipro Duo delivered by bestvetcare. Was sceptical about this product, but happy by seeing its results. I wish to continue this product for my two dogs. Thanks bestvetcare for sending my order on time.